December is here, I am so late! Ok, my children actually got the chance to open today's bag, don't worry. I started my post this morning but I didn't get the chance to finish it and that explains why it came so late. But in some part of the world, I may still on time. Last evening, I put my children in bed looking forward to having a quite moment. As I sat down after I was done with the dinner, I realized we were about to jump into December. And I didn't do this year's advent calendar. My initial plan was to take care of it after my daughter's birthday party. I thought I would have enough time left. So quickly I looked at what I have on hands. Then it struck me, I have my washi tape and more importantly a roll of green colors . It looks small but it is not. It's around 4 feet high. 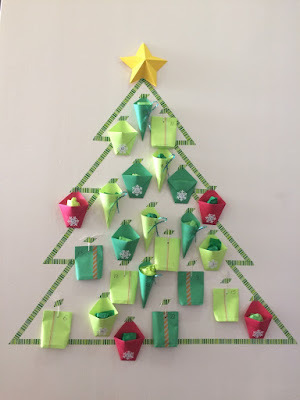 I first did the Christmas tree with the washi tape last evening and then I folded three types of bags this morning; a cone shaped, a pouch and a hexagonal. 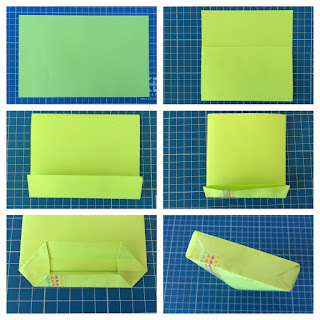 Here I'll quickly explain how you fold the hexagonal bag and the pouch. It shouldn't be necessary that I explain how to obtain a cone, right? There are plenty of videos available on YouTube should the above photos be not clear enough. I used washi tapes to add some colors, making it more pretty. 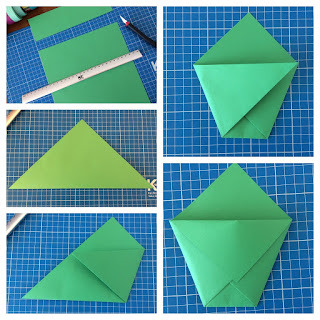 Cut a A4 paper into a square and fold it into a triangle. Then bend each bottom corner upwards so they cross. Eventually, bend the first layer of the upper part downwards. I glued a snowflake on it. I stapled a glittery ribbon on the cones. I filled the bags with stickers and chocolates. I even filled one bag with loom bracelets I did for them two years ago but forgot about them. I don't like the advent calendars they sell at the stores. I truly believe the price tag is not justified. The chocolate is not always of the best quality and the calendar is not the best looking either. So it's the perfect occasion to do your own personalized one that you can fill not only with chocolate but also with small gifts. Last year, I filled the bags with hair clips, cosy shocks and chocolates. As I run a bit late this year, I used the opportunity to let my children rediscover what they have. I did some loom bracelets for them two years ago. You know the kind of a bit sophisticated ones that require 10/15 replay of the same sequence on YouTube tutorials? The kind that leave you with a headache but also pride once you finished? Well, I thought they - I - deserve a second chance. Who knows, they probably forgot about them and will be so happy to have nice bracelets. I hope this will give you some inspiration for next year. It took me a bit less than 3 hours to do it, from the moment I started the tree to when I stuck the last bag.